Further plans have been revealed for the development of a new stadium for English Premiership rugby union club Bath, with officials assessing the merits of various sites for a temporary venue whilst the facility is being built. Bath currently plays at the 14,500-capacity Recreation Ground, but plans are in the works for an 18,000-capacity venue on the same site. The Stadium for Bath is exhibiting its latest plans to the public at the city’s Guildhall from today (Wednesday) through to Saturday, with a planning application expected to be lodged with Bath and North East Somerset Council early next year. The Somerset Live website received early access to the plans and has reported that the designs would include the development of a permanent, four-sided stadium on the land for the first time. The stadium would incorporate a riverside park, community facilities and a car park located under a raised pitch. The pitch itself would be fully or part-artificial in an effort to ensure wider usage outside the rugby season. In May, Stadium for Bath appointed engineering and design consultancy Arup to play a central role in the project. Arup will provide a range of building engineering and specialist technical services, with the company having been appointed following a multi-stage procurement process involving a series of workshops with the Stadium for Bath team. The workshops considered the engineering challenges posed by the proposed site, which is positioned in the centre of the UNESCO World Heritage city. 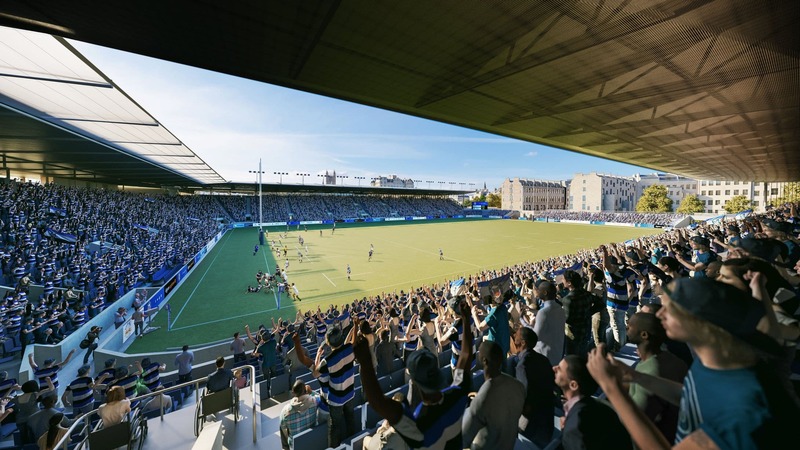 If approved by the council’s planning committee, Stadium for Bath hopes for construction to commence during the 2019-20 rugby season, with the stadium completed by September 2021. Bath Rugby will need to find a new home during development of the stadium, with Somerset Live reporting that the option of a groundshare at an existing venue has been discounted. Stadium for Bath has rejected this option after holding talks with venues including Cardiff Arms Park, Rodney Parade and Cardiff City Stadium in Wales; Ashton Gate and the Memorial Stadium in Bristol; Kingsholm in Gloucester; the County Ground in Swindon; the Madejski Stadium in Reading and Huish Park in Yeovil. Instead, building a temporary stadium in or around Bath with a capacity of 14,500 is the goal. Bath Racecourse, Lansdown Fields, the club’s old training ground at Lambridge, St John’s Field at the University of Bath, Sulis Club, Kingswood School and building a temporary stadium on the East side of the Rec have all been considered.